Tomb Raider is a video game developed by Core Design and published by Eidos Interactive. It was originally released in 1996 for the Sega Saturn followed shortly thereafter for MS-DOS and PlayStation versions. 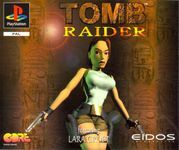 Tomb Raider follows the exploits of Lara Croft, an English female archaeologist in search of ancient treasures à la Indiana Jones. The game was commercially and critically successful, and is considered widely influential. It spawned a number of sequels and a franchise of related media. Source: Wikipedia, "Tomb Raider (video game)," available under the CC-BY-SA License.